Do you regularly request payments from your clients using Payoneer’s Billing Service? If so, keep reading to learn how we just made it so much easier for your clients to pay you quickly and on time. At Payoneer, we are always looking for ways to help our customers conduct international business activity easily and at low cost. We recently introduced tools to help your clients track and pay the payment requests they receive from you simply and quickly. When your clients pay payment requests, they’ll have the opportunity to save their details while making the payment. Clients who save their details will then enjoy a payment flow that takes mere seconds. In addition, they will have access to a one-stop-shop for tracking and paying the payment requests they receive. 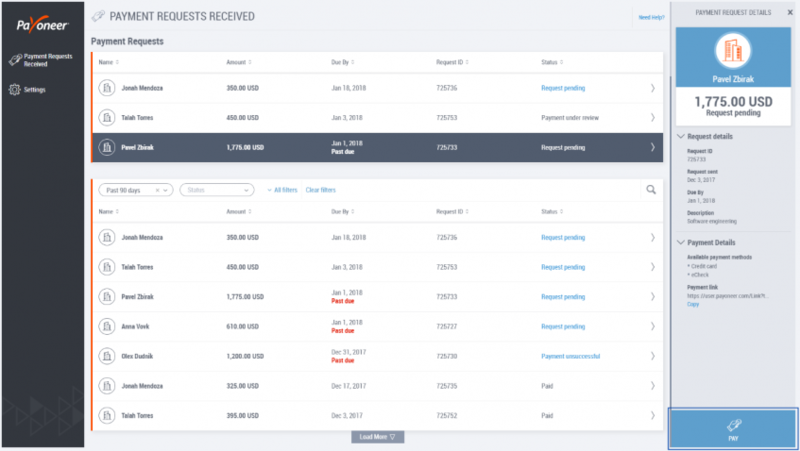 From the Payment Requests Received page, they will be able to track incoming payment requests, quickly identify requests that are due to be paid, and pay them in just a few quick clicks. The ability for your clients to execute payments quickly and use tools that better enable them to track and make payments on time means reliable cash flow for your business. Want to help spread the good news to your clients? Send them a link to this blog post.